LAT-Cube™ is an automated and secured dispensing VAULT for your CD/DVD/BluRay media collection with a BUILT-IN patron self checkout system. Basically, all of your highly circulating media is stored inside the system and is only dispensed to authenticated patrons. Therefore, your items are totally secured with NO ADDITIONAL ITEM COSTs needed to secure them. The built-in self-check allows processing of any items (books), not just CDs and DVDs. Its a "One-Stop-Shop" for patrons - all materials are processed and checked out at this station. LAT-Cube™ is designed to function as the "gatekeeper" of the library's collection of CD's, DVDs, BluRays, Game Discs, ...etc., - anything media. The discs are safely filed and secured inside the LAT-Cube™ vault awaiting self-checkout by patrons. Free yourself from any special handling of media to secure it. In attempts to secure optical discs from theft, libraries have tried different types of special handling for disc materials. Such labor intensive, special handling activities are holding discs behind circ counter, placing discs in special lock cases, or applying special security tags on discs. LAT-Cube™ eliminates all such special handling completely. LAT-Cube™ stores only the raw disc, no cases are required. This eliminates the need for the Library to purchase special cases, such as media lock cases that require staff time (labor cost) to remove the locks for each checkout to patrons (See LAT-Release™ if you are already using media lock-cases in your library). Since the digital discs are stored inside LAT-Cube™, front-gate security is no longer relevant for digital disc materials. Therefore, the Library need not invest budget funds on security gates or security tags for CD/DVD/Game discs. There is no need to purchase lock-boxes, magnetic strips, RFID-donut tags, or lock items behind the counter. 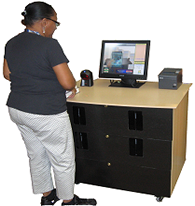 Complete Self-Check System (FlashScan™) included ! 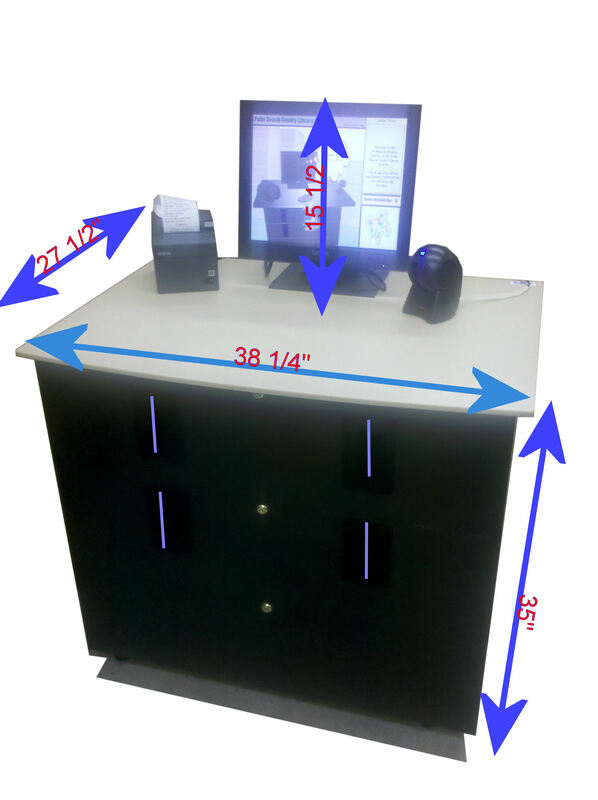 LAT-Cube™ incorporates a complete FlashScan™ patron self checkout unit inside of it. Now, all of a patron's check-out needs are met at this one-stop station. Since the LAT-Cube™ system now costs less than a standard, "plain vanilla" book self-check, the LAT-Cube™ media dispensing capability comes at almost no extra cost. We always had problems with CD/DVDs being stolen. We also needed a self check machine. Now, we get both of our problems solved with LAT-Cube™ - great deal. Lyle Williamson Archivist, Unified Data Corp.
All of the transactions performed at the LAT-Cube™ machine can easily be reported in a variety of statistical reports via LAT-Central™, which is included with LAT-Cube™. The reports can run real-time - anytime. LAT-Central™ is our Enterprise Management Software which allows the library unprecedented capability of controlling, changing and reporting on any LAT-Cube™ station. – Talk to a human.